This year there was no way we would miss the light festival again! For the seventh time the light and music festival was organised in one of the most beautiful cities in the world. We spent three nights to see and experience all the installations: more than 80 creative art works, made by more than 200 artists from all over the world. And we must say the experience was much better than the light festival in our home town Ghent (Belgium), because the installations are spread over a much bigger area, and the festival takes place during 2 weeks (instead of 4 days). So, although lots of people visited the light spectacle, we never had the feeling it was overcrowded. 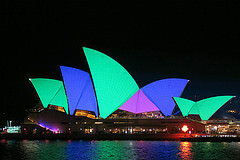 For sure a to do on your next trip to Sydney! Vivid Sydney 2015 from Travel for Motion on Vimeo.